Godsmack debuted the video for its latest single this week. The veteran rock band debuted the video for its new single ‘When Legends Rise‘ on Friday. The video crosses footage of the band performing live with new and vintage National Football League game footage. The addition of the NFL footage is a celebration of the league as its post season moves on. 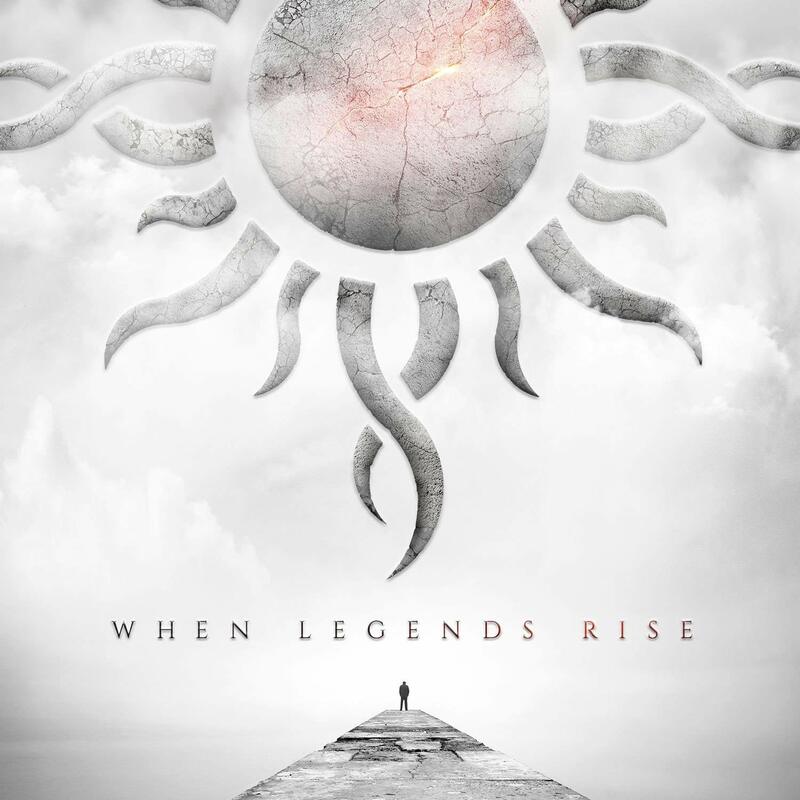 ‘When Legends Rise’ is the title track from Godsmack’s 2018 album, and is the album’s second #1 single. the album’s other #1 single ‘Bulletproof’ debuted late last year. That song was also nominated for “Rock Song of the Year” at the iHeart Radio Music Awards. The band in whole was nominated for “Band of the Year’ for this year’s awards gala. Additionally, ‘Bulletproof’ was the most-played song at rock radio nationwide in 2018. Godsmack is scheduled to launch the next leg of its tour in support of When Legends Rise next month in London. The tour is scheduled to run through March 31 in Bucharest, Romania. From there, the band will take some time off to rest and recharge before returning to North America for more live dates on this side of the Atlantic Ocean. The band’s current schedule is noted below. TNT is teaming with the NFL and NBA to present a special first-time ever golf event. the first-ever State Farm Showdown Hosted by Aaron Rodgers and Chris Paul is scheduled to air Friday night at 8 p.m. on TNT. It will air immediately after the airing of the 100th PGA Championship from St. Louis. The first-of-its-kind charity gold tournament will see stars of the NFL and NBA tee off (pun fully intended) in a variety of “skills challenges” including hitting golf balls at glass targets featuring their opponents’ likenesses, NFL stars trying their hands at three-point shots and NBA stars trying their hand at being quarterbacks. ESPN introduced its new Monday Night Football broadcast team to the media and the public on Thursday. That introduction included a conference call with the media to let reporters talk to the new faces of MNF — play-by-play man Joe Tessitore and analysts Jason Witten and Booger McFarland. Reporter Lisa Salters is the remaining member of the previous team. She joined the new guys for the conference call, in which a number of topics were discussed. They included MNF‘s season-opening game Sept. 10 between the Raiders (now coached by former MNF staffer Jon Gruden) and the Rams, critique and criticism of players by analysts, how the new team came together (in terms of chemistry, etc. ), critique of games overall and much more. Every one of those topics is discussed in the transcript of the call below. ESPN Senior Vice President of Event and Studio Production opened the call, and her introduction is included here. Credit goes to ASAP Sports for its part in transcribing the call. Druley: I will be brief because I really want this time to be used for you to hear from this team, that as Bill mentioned, we’re really excited about. We’ve been through a three-month process, and our mantra was “trust the process.” We did multiple auditions, a million conversations. We looked at a lot of tape. I think many of us could call the Titans-Chiefs playoff game from memory pretty easily. But we were looking for the best balance of passion for the game, depth of knowledge, and the ability to take that knowledge and form educated opinions. We also put a priority on chemistry because we wanted to put the best team on TV every week, and we believe Joe, Jason, Booger and Lisa is that team. We have a lot of work to do before September 10th [The new MNF commentator team will make its regular-season debut in the late game of ESPN’s week 1 doubleheader: Los Angeles Rams vs. Oakland Raiders], but Lee Fitting, Jay Rothman and Chip Dean have a plan in place, and we are going to get to work starting next week. Tessitore: You know, I echo what Steph just said in trusting the process. What I was most thrilled with in that process was how open-minded we all were to see what could be, and in doing that, the end result is who’s on this phone right here. Obviously, I’m thrilled to be working with Lisa. We’ve worked a little bit together in the past, and we’re going to lean on her experience and her expertise here greatly. But with Booger and Jason, this is a dynamic pairing. I’ve been so fortunate and blessed to work on so many different sport categories at ESPN through the years and so many different pairings with analysts, and the fit is just right here. It feels right. You know, I was honored — I’ve known Boog for four years now working together closely with everything we’ve done for college football, and when we were both part of the launch of the SEC Network. But over the course of the past month, month and a half to get to know Jason and to see how he approaches things in life and his work and his commitment, and then the two of them coming together, I feel it. It feels like the fit, and I’m just very excited for everybody to get to see what they’re going to offer up here. I think it’s a dynamic pairing. Witten: I just want to echo the same things. I’m so excited to be joining ESPN and the Monday Night Football team, and as they said, I’m champing at the bit to get started. In January, February, March and most of April this year, I was planning on playing football, but when you’re 36 in the NFL, I think it’s fair to say that you’re always day-to-day, and when this opportunity arose to be a part of an institution like Monday Night Football, for somebody like me who just has so much respect for this game and growing up as a kid, never missing a Monday Night Football game, to join this team, and I call it a team just because I realized that early on in this process when I went through it with Joe and Jay [Rothman] and Stephanie [Druley] and Lee [Fitting] and Chip [Dean] and the entire team. I realized that it was about a team, and I felt that chemistry, and just honored to join it and to join Boog, and I’m just champing at the bit. I know I’ve got a lot of work to do. Looking forward to sharing my knowledge and my insight on the game of football that we all love. McFarland: Well, Jason could have saved most of that and said he got old so he needed a new job. I’m extremely honored and humbled to be a part of Monday Night Football. I’ve been in college football for the last four years and have really, really enjoyed just giving my opinion and giving my thoughts in just the way that I know how, and I’ve been empowered to do that by Stephanie [Druley] and her team, and I just look forward to bringing that to pro football. I’m very experienced in that and look forward to that and can’t wait to get started. I’ve known Jason from afar, have worked closely with Joe, I’ve admired Lisa for a long time, so to get this opportunity to be a part of this team with these people, I’m fired up and can’t wait. Salters: Well, I’ve said it before, I have the best job in the world, and it continues to be my privilege to be a part of this team, especially this new team. Can’t wait to work with the guys, and it sounds to me like this is going to be our best year yet. Can’t wait. Q. I’m particularly interested in the September 10th game, the Rams at Raiders, where there’s so many story lines, and I’m wondering are you going to come to Rams camp at the end of camp, and particularly for Jason and Booger, have you talked to Jon Gruden, sort of tapped into what knowledge he might have about the job? I wonder what your thoughts are on that game. Tessitore: I’ll answer the first part of that. We have plans right now on our schedule that we all received to go and spend a day and visit with the Rams, so we are absolutely going to do that. Personally, I know we’ve talked about this as a group. We are very, very excited for that opener. I think the Rams, I think everybody would agree with this, they have been the offseason buzz team with what they accomplished in free agency with the win-now attitude. Got a dynamic young quarterback, obviously got the all-pros all over the place everywhere you look, especially now with the additions on defense at corner and defensive line. And then it being the return of Gruden to the Black Hole, the Monday Night Football opener, I think it’s going to be really special, and I’ll let the guys answer in terms of talking to Coach. Witten: Yeah, I did reach out and was fortunate to talk to Coach Gruden for a while during this process. I’ve long admired his work in the NFL, and so he was great. He shared a lot of detail with me about what all takes place. I think one of the things that he wanted me to know, and it’s been echoed throughout the entire staff, is how much work it takes, and I think he had tremendous detail and passion for what it takes. We had a good visit over the phone, and I’m certainly going to take advantage of all the resources to get into camp with this team, and I’m champing at the bit to do that because I think the only way we’re going to improve, I know certainly for me, is to get out there and see these teams and start studying them and having that opportunity. As Joe said, our schedules are booked out, and we’re excited to get going. McFarland: You know, I didn’t get an opportunity to talk to Jon during the process. I played for Jon, and I know how hard Jon works getting up at 3:00, 4:00 in the morning to come into the office and get prepared, and living here in Tampa where Jon lived at, I got a chance to kind of visit his office a couple of times while he was preparing for Monday Night Football, so I know the type of work that it takes to do this job and do it at a very high level like Jon did for the last nine years. As far as the Rams-Raiders game is concerned, I think for me the early story lines are really not a lot about football. You look at the Rams, to me it’s about chemistry. We’ve seen a lot of teams put a lot of players together and say we have an All-Star team, but those players don’t fit. So can Wade Phillips and McVay get the chemistry right with all those guys. And then for Jon Gruden, having played for Jon Gruden, one thing I know about him, he likes veteran players, and you can see the veteran players starting to be assembled in Oakland. I think he still knows how to coach football, but can he coach football in 2018 with this group of players, a lot of young players. I think those are some of the early storylines. I think it’s going to be a great game. Maybe I’m biased, but I think we’ve got the best game opening week on Monday night. Q. Jason, I was just wondering, for a long time you’ve been in those production meetings a day or two before a big game where you’re talking to the TV analysts, and now it’s going to be you talking to players. What do you think it’s going to be like kind of sitting on the other side of that, and then specifically your first time when you have to go back to the Star? Witten: Well, first off, it’s a great opportunity. I know how much information this team was able to receive when they came in and you were able to sit in these broadcast meetings. You know that they’re doing — these analysts are doing their homework. They’re studying film. They’re approaching it the right way. I look at it as a great opportunity, not only to get to spend time with the coaches and players, but as I’m studying, I’m going to have a lot of questions, and I want to use that time to build a relationship and to get information. I know the rest of the team is going to do the same thing. I always think that there’s great chemistry in those times, sitting in those meetings over the years, very comfortable doing that. I’m sure it’ll be a little bit emotional when I come back to the Star and see some teammates and friends of mine, but I think that’s just part of the process, and we’ve all experienced it, and there’s special moments and emotions that go into it, but I’ve had the opportunity over the last week to really reflect, and I’m so proud of the way I approached the game and the people I was able to do it with. And now I’m able to transition into this and attack it the same way that I attacked it for 15 years as a pro player. You know, it will be great to see those guys, but we’ve both got a job to do, and I think there’s a healthy respect for that. Tessitore: Witt, where are we going to eat the night before that game? Witten: We’ll go to Nick and Sam’s, show you what a real steakhouse looks like. Q. Jason, I know this is still obviously very new, so I ask this question under that framework, but what is your comfort level on being critical of players or coaches when criticism is warranted, and how do you philosophically look at NFL analysts being critical of players and of the game itself? Witten: Well, I think you have to have the confidence to share thoughts that are going to be critical or potentially could be critical of a player or coach or a decision that’s made in a game. That’s a challenge and a role that I accepted, and I understand it, and certainly I’ll embrace that situation. As a player, I never allowed my feelings to get hurt in that situation. I never felt like somebody was personally attacking me. They have a job to do. They have to call the game. People are looking for their insight. And so with that — the ones I respected the most as a player are the ones that called it like they see it. They tell us why and provide reasoning for that. And so that’s going to be my approach. That’s a lot of concerns as I’m walking into a different territory, but this is not one of them. I feel confident, and I have such a healthy respect for this game and the coaches and players and what it takes to perform at a high level, but that’s what my job is, and I think I’ll do a good job of communicating that and telling the why, why that’s happening and why my opinion is formed that way. Q. Jason, obviously this is a high-profile gig for your first TV work, but Tony [Romo] — how much confidence did you get from seeing Tony pull this off last year, and what has he shared with you, if anything, about what it takes to do this job? Witten: Well, first off, I mean, Tony has been a great friend for a long time. We did visit regarding this situation, but it was briefly. It happened so fast with it. I’m sure as it unfolds the next few months, he’ll continue to be a great friend and a resource for me. In reference to how he performed, I thought Tony did a really nice job in his first season. I thought he really brought a new approach. There was a freshness in his approach. His energy level was really high. I think a lot of people really enjoyed hearing him call the games the way he did. At the end of the day, I think people really liked his insight. He had a unique perspective, and I felt like he was teaching oftentimes. And I think that’s something from coming right off the football field, speaking that language and seeing it quickly certainly — I think there’s probably a lot of similarities in our approach from that standpoint, but hey, look, you’ve got to be yourself, and as I’ve gone through this process and studied other guys and watched it, the one thing I’ve always gone back to and the team around me has told me numerous times during the auditions was that you need to be yourself and have confidence in that, and look, I have had a lot of reps at doing that, of being myself, and continuing to work at it and approaching it. That’s the way I approached my career was, I was able to figure it out fairly quickly. So I think there’s a lot of insight in being able to provide teaching with it, and Tony did a really, really good job and made people feel comfortable, like he was sitting at the house on the couch, and he communicated that very well, and I hope to do the same. Q. Stephanie, what was the reasoning or what is the reasoning to have Booger on the sideline as opposed to having three people in the booth? Druley: We like the perspective. We’ve had success with that on college football, and we’ve found that it’s a unique perspective for someone to have, and when we started the process, we had that idea in mind throughout the process, and we felt like if we found the right person who could pull that off that we would go in that direction. It just feels like a unique opportunity for us. Like I’ve heard a lot of comparisons to, oh, this is this old [Tony] Siragusa role. To us, it’s not. To us, Booger is a seamless part of the booth who has a unique perspective of being at field level, seeing what’s going on in the trenches, seeing what’s happening on the sidelines. I just think the perspective will be different and will be really interesting. But at the same time, like the goal for Joe and Jason and Booger is to have it feel seamless. Q. I think maybe specifically for Joe in terms of was it kind of a goal as a kid? How did that work out for you in terms of your career goals? Tessitore: There’s no denying it. If you’re of my generation and grew up the way I did sports obsessed and really football obsessed, yeah, I mean, Monday Night Football is that pinnacle. Somebody asked me earlier how I view this job. 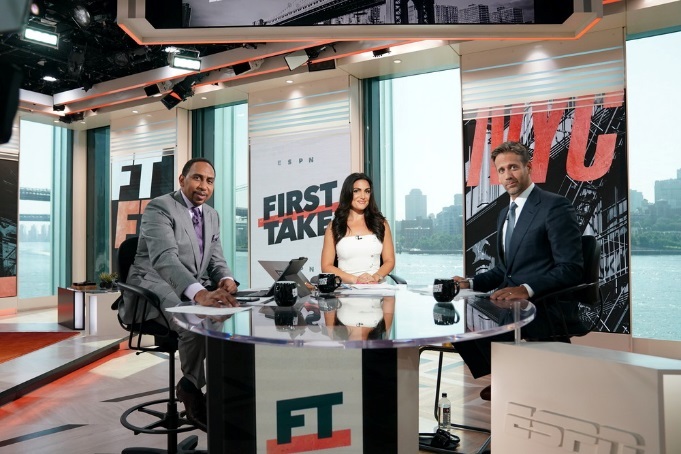 I really do view it as a legacy job, as a job that is tied to the lineage of sports broadcasting, with Keith Jackson and Frank Gifford and Dandy Don [Meredith] and Al Michaels and [Howard] Cosell and through the more recent generation of [Mike] Tirico. It’s been that job for me. I was greatly contented in college football and so infused in that sport, and there are very few jobs if not only one job that I would consider saying goodbye to college football for, and this is it. But I will share just one brief story. I grew up in Schenectady, New York, in an Italian-American neighborhood. I’m the son of an immigrant, and my grandfather couldn’t speak English, but everybody in my family, sort of assimilating to American culture, came by way through sports and sports television, and watching Cosell and watching Monday Night Football and major horse racing and Wild World of Sports and championship boxing of Ali in the ’70s was sort of that link for my cousins and me and our aunts and uncles and our grandparents and those who couldn’t speak English, and when I got this job, we had — unfortunately I had to go back to a funeral service in Schenectady, New York, to the old neighborhood, and all my older aunts and uncles, the first thing they said was, we can remember when you used to impersonate Cosell as a way to get your grandfather to laugh, and we had told that story for years and years, and that was Monday Night Football. I would impersonate Cosell as a way to connect with my immigrant grandfather. So yeah, man, you hit on it, and it’s been that kind of job in my eyes for a long time. McFarland: I think for me, even as a player and once I retired, the ability to remember standalone games, whether it’s Saturday nights when you’re in the hotel before the Sunday game watching college football, the primetime game, or it’s Monday night when you’ve already kind of reviewed your film and everybody is at home and you’re watching the Monday night game. I think as a player, we all remember the games that stand out. We all remember the signature games. And Monday night happens to be the signature game. And for me, I never thought about being a part of a Monday night broadcast team. I got into broadcasting four years ago with an opportunity to smile and be myself and talk about football, and not knowing if it would work. And through a lot of hard work and a lot of opportunities by a lot of good people, I’ve been put in position in college football to do a lot of good things talking about the game. And when the opportunity came about to do Monday Night Football, I never dreamed that big. With that being said, now that I’m here, I look forward to carrying on the tradition of making Monday Night Football fun again, man. We get a chance to talk about the game of football. It’s entertainment. It’s the ability to enlighten people about what we see. But as I’ve told everyone on this call from the ESPN side, people watch football for entertainment. Yeah, we want to learn a little something. We want to laugh. We want to enjoy the two or three hours that we’re going to spend watching our favorite team or a team that we don’t know. And so for me that’s the intriguing part and that’s the exciting part for me, one, the ability to be a part of something so historic and so great that I never even dreamed or even thought about doing, and two, the ability to do it the way that I think a lot of people want to see it and want to enjoy it, and that’s fun, and that’s entertaining, and that’s the ability to learn something. You know, every now and then, you’re going to get a chance to have those great moments that Monday Night Football brings, and you never know when they are coming, and to me that’s the exciting part. Witten: Yeah, I’ll just echo the same things. I said early on, Monday Night Football really is an institution, and it’s the best of the best. I grew up watching Al Michaels and John Madden call those games. My grandfather was my high school football coach, so he would tell me about Dandy Don [Meredith] and the Giffords and Cosells and just such history. To have an opportunity to carry on that tradition as Booger referenced and enjoy it and teach and share our insight and have a great time, I think that’s what is so special about it. I know playing the last 15 years, you always circle that Monday Night Football game because it’s the only game on. It’s the end of the week in the football world, and it’s an opportunity for everybody to watch and to share it. I heard a lot about the schedule and what Monday Night Football is compared to what it used to be, and I’ll be honest with you, I’m really excited about where it’s at and the games that we have, and not only turning on that torch and the tradition but taking it even to a new level, along with this team. Q. Jason, I have a question. Were you approached by other TV networks such as FOX about working on their NFL game coverage, and if so, why did you pick ESPN? And then I’ve got a broader question for everybody in the group, which is why do ex-Cowboys keep getting all the good jobs in NFL TV? Witten: I did have an opportunity to talk to some other networks. I don’t want to go too crazy into that. But I just — at the end of the day for me, I’m a big believer in the team, and I went through this process, it just leaped off the screen at me when I left there. I was calling these games and surrounded by these folks, that there was just a different touch that they put on it. And so having the opportunity to go into this together with Joe and Boog, and then obviously with Stephanie [Druley] and Lee [Fitting] and Jay [Rothman] and his team and the tradition that they’ve had, that was something that was very enticing to me to be a part of that, Monday Night Football, as I said. I was fortunate to those other networks that entertained the fact of bringing me in and talking to me, but Monday Night Football is a great fit there at ESPN for me. Tessitore: I’ll quickly answer my thoughts on the ex-Cowboys getting all the jobs, and I’d love for Lisa to chime in because she has covered so many big-time Cowboys’ games. But I started the early stages of my career in that market, as did Stephanie Druley, who’s on the line, and I think anybody who’s been in that market day in and day out knows that you are constantly in the spotlight and being forged for stuff like this. When you are a superstar Dallas Cowboy, when that star is on the side of your helmet, you wake up every day dealing with the pressure, the coverage, and I think that a lot of guys who have gone through that, they equip themselves incredibly well with the media and they’re in position, and there’s just no denying that experience. Now, we didn’t go into this thing saying, hey, if we can land a Dallas Cowboys superstar we’re landing it; it just so happened that we came out here with Booger and Witten and a big smile on Jerry Jones’ face I saw the other day. Very proud of you, Jason, as well. Lisa, would you agree that it’s always just a little different when it comes to the Cowboys? Salters: Sure. If you’re going to play, like you said, in Dallas, you’ve got to know how to handle the media. So I feel that — I don’t know about Tony [Romo] and the other jobs, but I just feel like we’ve got Jason, and I don’t care if he had played for the Packers, the Broncos or whoever. I just feel like we got a great guy who’s going to just take our team to another level. And Boog, too, of course. I don’t care who they played for in the past. I just feel like, like you said, we didn’t go out trying to find ex-Cowboys, we just got guys who are going to be the best fit for us and make us better. That was one thing Jon Gruden always said. Either you’re going to get better or you’re going to get worse. You’re never going to stay the same. And we’re definitely better now. Druley: You know, just as a producer, for guys that are in that facility, they’re always getting — look, we all know that the Cowboys are the team that networks would like to see as much as possible on their schedules, so they’re getting the experience with the top-notch groups that come through there when you talk about a production meeting. So I think that can — you’re sort of learning on the fly, as well. You’re seeing how some of the best do their job, and that along with the spotlight that Joe mentioned, I think prepares these guys to be extremely eloquent and able to understand sort of what this side of the camera is like. McFarland: I was hoping one of you brought it up. I was kind of preparing my list of all the Bucs over here. I think when people look at Dallas — I grew up in northeast Louisiana. I was a Cowboys fan more than I was a Saints fan, so we all recognize the history and the intrigue of being America’s team. I think when you’re around the spotlight, when your team is winning as much as they’ve won, when you have an owner with a personality like Jerry Jones, you’d better be good in the spotlight or else you’re going to get exposed. Q. Jason, if you can put your analyst’s hat on for the first time, the guys that are replacing you in that tight end room have nine catches between them. What can you tell us about Geoff Swaim, Blake Jarwin, Rico Gathers and obviously they drafted a guy in the fourth round, Dalton Schultz, but what about the guys that you were with the last couple years? Witten: Yeah, I mean, first off, just piggy-backing on that last question, I also think that certainly playing for the Dallas Cowboys has provided opportunity, but when you look at those guys like Troy and Daryl, I mean, they’ve earned it. They’ve been really good. That definitely provided opportunity, but they’ve been taking it to another level with the way they’ve performed and called the games. To your question, look, they haven’t had a lot of opportunities to play, but I think in the last week, we’ve seen that Jerry [Jones] has come out and said that he feels confident in this group. And so playing with Geoff Swaim for the last three years, I think there’s some upside to his ability, he just hasn’t played a lot of games. They really liked him, they traded up in the draft for him, and I think for those guys, they’re going to have their role in how it’s all going to play out. They certainly like Rico. He has a big ability to stretch the field. Coming off the basketball court, he is athletic, he can make plays. Can he do it for 60 plays? He hasn’t shown that consistency to be able to do that. And so they’re going to have to lean on Swaim to be able to kind of carry the workload, but they do have a young talent in Jarwin and Rico that I think they see as a little bit of flash player that can come in and have roles in the red zone or 3rd down in the passing game. Those guys will be okay. I mean, I still liked sitting in those meetings with them and going through this the last few years, they know what it takes to play that position, and I hope that I’ve shown them that. But they can’t put the pressure on themselves. They just need to go play and feel confident in their system. Scott Linehan has had success with tight ends, so they’ll figure out their roles and what they want to do, and really more than anything, they’ve got to get comfortable in this back-friendly offense that they’re building in Dallas. Q. Joe, when you were doing these tryouts with Jason over the last couple of months, what would you say clicked with him that clicked in a different way than some of the other people you tried out with? Tessitore: Well, I’ve got to tell you, everybody that we brought in was pretty impressive, but — Boog and I have known each other for a while, so when I started talking about chemistry, not to leave Boog out, but I want to answer your question about Jason. Boog is like part of my family at this point. Truly when he comes to Connecticut, he’s coming over for dinner, he’s with the family. He’s just part of the Tessitore family at this point when he comes up north, and we’re always together on the road having a good time, as well. When Jason came over, I had already spoken to him on the phone extensively for weeks. We had worked on the phone. We had started to develop a relationship. But I would tell you the chemistry just felt right. Came through the front door, he’s in the kitchen, we’re opening up wine. My wife is cooking. We’re having apps. About a half an hour into hanging out talking ball having some laughs, enjoying each other’s company, my son pulls up, he’s an 18-year-old high school football player, and he’s got a carload of his buddies, which he’s wont to do typically every other day so they can make that sure our pantry is cleared out. And they come into the kitchen, they see Jason Witten and all of a sudden he’s holding court with all these high school football, college football-bound football players. They’re there for about 10 minutes, they’re having a blast. They ask if they can take a picture. As they’re walking out, Witt turns to them, and he says, hey, guys, you got a football in the garage? Like of course we do. The next thing I know, the custom sport coat is off. He’s out there in slacks and dress shoes, unbuttons the dress shirt, and he’s running routes against high school football players on my front lawn. Seamlessly just out there. These guys are laughing their butts off. They can’t believe that this all-pro player is out there. Without missing a beat, he comes back in, he’s got a little glisten of sweat. He’s got the prosciutto in his hand, the cheese in his other hand, and he’s back to eating and talking football. He’s a dude. That’s what I like, man. I like football-loving dudes who can hang out, have a good time, and if you can do that with me in my house, then I know that the three and a half hours on the air are going to be killer because you’re going to be the keyword that makes for great TV: Authentic. That’s what Booger and Jason are. They’re authentic. And then the two of them came over to my house about a week and a half, maybe two weeks later, and it was on fire. We just had a blast. That’s the one thing, if you say what’s the key trait and attribute, I see it. I see a lot of things. I could to you about football IQ, I could talk to you about work ethic, dedication, drive, leadership qualities that Jerry Jones will tell you about all day long when it comes to Jason Witten. But this is an authentic, real football dude, and that’s the chemistry fit that I was looking for. Q. Booger, you’ve got a couple of experiences that are a little bit unique for this role, both your long career on the defensive line and then the last few years doing college football studio analysis, what are you going to bring to this role from those two experiences? McFarland: Well, I just think the ability for me to be direct and straight to the point. I think when you watch football, especially when you watch it down close on the sideline, there’s a unique aspect to feel the speed of the game and to see little nuances that happen on the sideline, whether it’s between players, between coaches, the ability to walk people through plays. You know, we talked earlier about the ability to be entertained and educated, and I think the ability to do that from the field is going to be greatly appreciated. From the college experiences, I’ve done a couple of things on the field, and this will be nowhere near the magnitude we’ll be doing it now, but just those experiences are definitely going to help with this new role. Q. My question is for Jason. I’m sure you saw some of the coverage of Cris Collinsworth getting brutalized by Eagles fans for his analysis during the Super Bowl, and I was wondering if you’ve given any thought or prepared yourself for just being attacked by some fans who are just going to claim that you hate their team no matter what? Witten: Well, I’ve had thick skin for a while. I mean, that’s happened my whole life, going on the road and getting booed or saying things to me. I’ve been called almost everything. You know, that’s part of competition. But I think to echo what you asked, with Cris, you know, I can’t stand when I’m listening to a game, and you get the sense of a homer type of guy or a guy talking about we, or influencing his opinion. That’s not what Cris does. That’s not what these really good guys do. So I’m going to be objective, and if I fail at that, then I’m failing the viewer and I’m failing ESPN. Look, I know that that’s what they’re betting on me, and as I said earlier, there’s a lot of things I have to work through and a lot of work to do, but this is not one of them. I mean, that’s my job, and guys are going to make mistakes. They’re going to fail out there on the field, and there’s probably going to be a few bad decisions. So I feel comfortable with our team, and I’ve said in those meetings many times with Lisa over the years and she’s had to ask me tough questions, and that’s just part of it. There’s a healthy respect, and I move on from it. I’m going to be objective, and I feel confident doing that. Look, those boos are going to happen for a long time. They’re not going to stop now. Tessitore: And I just want to point something out in this crew here, this three-man crew here that’s going to be doing the game. I think Witt really put forth a great response as to how he’s going to handle both criticism and his ability to criticize, but one of the things that has impressed me most with Booger in recent years was when he was one of the premier voices on the SEC Network, and it was the time when Les Miles was really starting to get a little warmer on the hot seat, and the coaching change was coming down, and you could see it on the horizon, and the way Booger handled that, being one of the greatest players in LSU history, having a big seat on an SEC platform on that network, which obviously you know the relationship with the league there, and I think Stephanie [Druley] would speak to this, but I thought those four weeks where Booger didn’t shy away, where he shared a very strong opinion that could be often difficult for somebody who wore purple and gold really showed us — for everybody here at ESPN, what he was all about and how strong of a broadcaster that he could be. That was an impressive run there. Q. Joe, Jason and Booger, last year there was a lot of not-so-stellar games to say the least in the NFL. A couple of the booths, in particular Sean McDonough, was critical of the officials at times and the quality of the games. How do you guys plan to approach if you’re calling a game that’s not so entertaining halfway through? Tessitore: I mean, when you’re doing a game that either becomes ugly football or the score gets wacky, that’s why we prepare so hard. That’s why we know all the back stories. That’s why we’re ready to entertain, we’re ready to go in different directions when the score isn’t as compelling. You know, heck, I’ve done that for a couple decades of college football and various sports I do. We showcase our preparation. We showcase everything that the talented people in the truck and the production unit have been working on all week. We tell stories. We take you in a different direction. Where Lisa can take us with the access she has, the reporting she has and things she’s prepared for; Booger with this unique position where we’re not going to be just tied to the booth, where our eyes and ears are going to be everywhere. But it’s bound to happen. Did you just mention officiating, too, in your question? Tessitore: Listen, I’m very strongly opinionated when it comes to that. I don’t think anybody tunes into a football game to care about the officiating. If it becomes a factor, we’re going to talk about it. We have an ex-referee in the booth with us to bring clarity to things. But we’re going to be entertained with great athletes and great storylines and watching the game. I’m not going to sit there and call a football game harping on officials or making that something that becomes a theme to our broadcast, that every time there’s a controversial call or a pass interference or a questionable holding, we’re pointing it out and we’re going too far. It’s about ball, and I’m just not — listen, I’m big into no complaining, and I think a lot of people — I want a joyful broadcast that centers on celebrating the game and these athletes and the action. I don’t think anybody tunes in to watch a football game to complain about officiating. That’s just me, though. McFarland: I think when you tune into Monday night, being the last game of the week, you have a unique opportunity not only to broadcast a signature game and to entertain that night, but you also have a unique position that you’re the last NFL voice of the week, so if we could encounter a game that’s a blowout or a game that’s not as fun and entertaining, we have an opportunity to pull from a week’s worth of entertainment, whatever the storylines are, whatever the big-picture items are, and as Stephanie [Druley] mentioned earlier, the chemistry of this group with the ability of myself and Joe and Lisa and Jason to talk and have conversation, we want this to feel like we’re four people and we’re watching football, and America just gets an opportunity to ease up and see what we’re talking about. That conversation about football when you love it, it’s going to be great when the game is great, and it’s going to be great when the game is bad because of the chemistry of the people in my opinion. Tessitore: Boog, I talked to you about this a couple weeks ago. I said my vision for Monday Night Football is much like the ethos and all the juice that College GameDay has or that Inside the NBA has. I don’t tune into College GameDay whether or not they’re doing an FCS location or the quality of the game or they’re doing LSU/Alabama both undefeated. When I listen to the guys on Inside the NBA or some of the other shows on our air, as well, but some of our rival networks, it’s about that messaging and that dynamic and that chemistry. I want to hear from those iconic brands, and that’s what I’m looking for from us, for our voices, our chemistry, our dialogue to be great and to be desired by the fans no matter what the game looks like. Now, having said that, I love our schedule this year. I think it sets up wonderfully. Witten: Yeah, I was just going to add – going through this process I heard a lot about the Tess effect, and so science has told me that that’s going to translate over to Monday night, as well. Tessitore: Yeah, we only hope. Hey, I’m not the one who has a giraffe named after me now. Congratulations on your giraffe. The 2018 NFL Draft is less than a week away, and ESPN will have extensive coverage of this year’s draft from beginning to end. This year’s broadcast of the draft marks the 39th consecutive year that ESPN will cover the draft. It all begins with dual coverage of Round 1 next Thursday, April 26 at 8 p.m. from AT&T Stadium in Arlington, TX. Trey Wingo will anchor ESPN’s broadcast of Round 1. He will be joined by Draft Analyst Mel Kiper, Jr., ESPN NFL Front OFfice Insider Louis Riddick and ESPN college football analyst Kirk Herbstreit in his draft debut. Also scheduled to appear throughout Round 1’s 32 picks are key contributors Todd McShay, Chris Mortensen, Adam Schefter and Suzy Kolber. On ESPN2, Rece Davis will anchor College Football Primetime at the NFL Draft presented by Courtyard. The broadcast is a college football themed presentation of Round 1. Joining Davis for the broadcast will be College GameDay‘s Desmond Howard and David Pollack alongside ESPN college football analysts Joey Galloway and Booger McFarland. Tom Rinaldi and Maria Taylor will also make appearances on the broadcast. ESPN will also have reporters embedded with some of the teams throughout Round One. Josina Anderson will be embedded with the Cleveland Browns while Diana Russini will be in the New York Giants’ camp. Sal Paolantonio will be with the New York Jets while Jeff Darlington will be with the Buffalo Bills. Rounds 2 and 3 will be simulcast April 27 on ESPN and ESPN2 while Rounds 4-7 will air April 28 on ABC and and ESPN. Trey Wingo will anchor broadcast of Rounds 2 – 7. He will be joined in each broadcast by Mel Kiper Jr., Todd McShay, Chris Mortensen and Adam Schefter. The full broadcast schedule for the ESPN networks’ coverage of the 2018 NFL Draft is noted below. *Golic and Wingo will also be simulcast on ESPN2 from 6-7 a.m. ET. Along with coverage on television, ESPN will offer coverage online and on the radio for those who won’t be near a television during the draft. Coverage will stream simulcast on the ESPN App. Extra bonus content will also be available on ESPN+. ESPN Radio will carry coverage of Round 1-3 starting April 26 at 7 p.m. ET and April 27 at 6 p.m. with Dari Nowkhah at the helm. Nowkhah will be joined by Pro Football Hall of Famer and ESPN NFL Front Office Insider Bill Polian, reporter Ian Fitzsimmons and retied NFL star (and current ESPN new York 98.7 FM host) Chris Canty for additional commentary throughout. Freddie Coleman will host post-draft coverage both nights at 11:30 p.m.
As if all of that coverage is not enough, ESPN Deportes will carry coverage of Round 1 while Round 2 will be available in Spanish via the ESPN App. Eduardo Varela, Pablo Viruega and Miguel Pascal will be on hand for the broadcasts. They will be joined by Alba Galindo and Keneth Garay will have additional commentary along with reporter Carlos Nava who will report live from inside AT&T Stadium. ESPN International will carry coverage of the draft in Latin America, Brazil, the Caribbean, Australia, New Zealand, The Pacific Islands, Canada (on TSN), and Africa (on Kwese). All three days of the draft will air on ESPN International in Mexico and Central America, with the first two days being broadcast entirely in Spanish. Only the first day of the draft will be carried in Spanish throughout South America, save for Brazil, where the first two days will be broadcast in Portugese. All three days will be broadcast live across the Caribbean and Pacific Rim. All broadcasts will be simulcast online via broadband players in Brazil, Australia, New Zealand and Pacific Islands. Viewers in the Caribbean and Spanish-speaking Latin America can stream the draft online via ESPN Play.